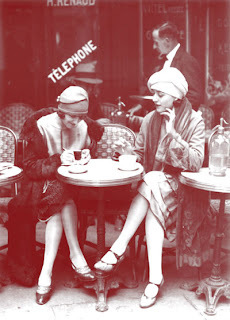 Was so pleased and surprised to happen across this Maurice Brange photo of writers Solita Solano and Djuna Barnes at a Paris café in 1922. 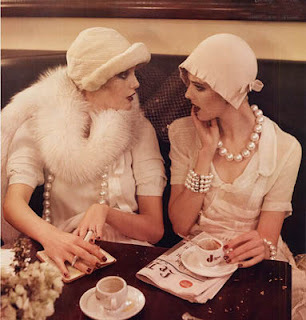 I suspect Vogue's Grace Coddington and photographer Steven Meisel must have seen it too, when conceiving one of the most beautiful editorial shoots ever, Paris Je t'aime, for the September 2007 issue (and the subject of one of Grace and Anna's ongoing battles for page count in life and in the documentary The September Issue). As for the fashion, this sort of pearly-toned, fur-and-silk styling is perfect for New Year's Eve--see if there's not something here to inspire you. I have had the orginal photo saved to my computer for years and never knew who the women were-now I know! Thanks for sharing! It's a pleasure, Lesley Ann . . . I lived in Paris for a couple years but had never seen the photo before Sunday; it's wonderful. Will have to find out more about Brange.